C|M|LAW Library Blog | Context on Lexis: What Is It? Where to Find It? Context on Lexis: What Is It? Where to Find It? Context is Lexis’ language analytics product that helps build the best arguments for cases by knowing how judges are likely to rule on motions. The language analytics are deployed across millions of documents, so a user can quickly identify the language a specific judge frequently relies on and/or understand how an expert’s testimony stands up to judicial scrutiny. 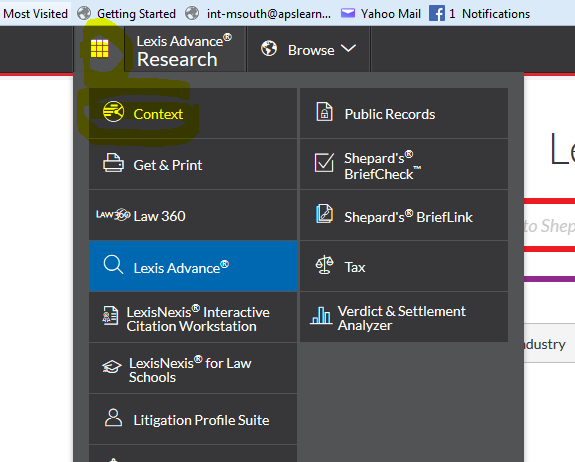 To access Context, sign in to Lexis Advance and select ‘Context’ from the product grid in the upper-left corner. By a vote of attendees at Legal Week in New York in January, Context won the Legaltech Product Innovation People’s Choice Award.